Dated from 1912, this is the officers' version of the 1908 troopers' sword. 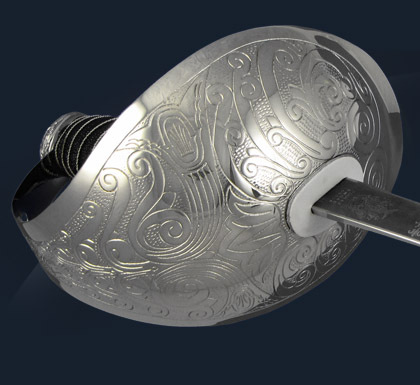 Its carbon steel blade is decoratively etched including the regimental crest while the guard features an elegant honeysuckle design chased into the nickel-plated steel. The black fish-skin grip, bound with silver-plated copper wire, is capped with a stepped pommel. Both leather Sam Browne and nickelplated scabbards are available, for service and dress wear respectively. The British Cavalry have always carried their own highly individual sword patterns. Harking back to the days of pitched mounted battles, cavalry swords are generally longer and heavier than their Corps and Regimental equivalents– offering the heft and reach that was once a matter of life and death. Today, these fine swords are carried by the Dragoon, Light Dragoons, Hussar and Lancer regiments.